This May, Emirates is offering exclusive rates to Metrobank cardholders for flights to some of the best destinations in Europe. 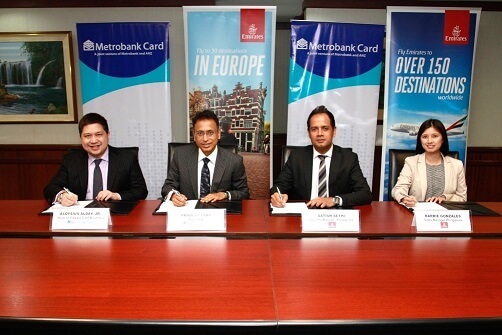 Emirates and Metrobank recently signed a partnership where Metrobank cardholders can enjoy discounts for Emirates flights to Europe when they book their flight using their Metrobank debit and credit card. In the photo are Metrobank President Pradeep Pant and Emirates Philippine Country Manager Satish Sethi. Under the promo, Metrobank card holders can enjoy flights for as low as US$696 for Economy Class flights and US$2392 for Business Class flights for a select number of destinations, when they book their flight via the Emirates website at https://www.emirates.com/ph/english/ and pay with their Metrobank credit card. Promo period is from May 17 to May 31, 2018. Travel period is from June 1 to December 31, 2018 and January 21 to March 15, 2019 for Business Class and Economy Class flights. The promo was launched by Emirates in partnership with Metrobank through a contract signing between the two parties last April 25, 2018. 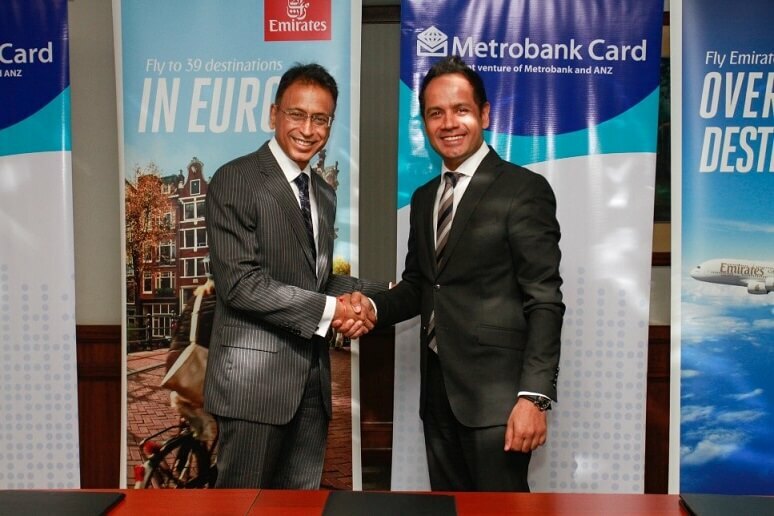 Emirates and Metrobank recently entered a partnership that gives Metrobank cardholders discounts for Emirates flights to Europe when they book their flight using their Metrobank debit and credit card. In the photo are (from left to right) Metrobank Head of Prepaid Card Business Aloysius Alday, Metrobank President Pradeep Pant, Emirates Philippine Country Manager Satish Sethi, and Emirates Philippines Sales Manager Barbie Gonzales. “Emirates is all about providing a unique travel experience to our customers. Through this partnership, more Filipinos will be able to enjoy the premium services and comfort that is synonymous with Emirates,” said Emirates Philippine Country Manager Satish Sethi. “A lot of Filipinos consider travel as one of their goals, which is the reason why the local travel market is thriving. By working together with one of the most globally-recognized and respected airlines in the world, not only are we able to serve the needs of our customers, we are also able to fuel more activity in that market,” said Metrobank President Pradeep Pant. Emirates was recently named ‘Airline of the Year’ at the 2018 Air Transport Awards and was also a recipient of three Regional Passenger Choice Awards for Best Entertainment in the Middle East, Best Inflight Wi-Fi in the Middle East, and the Best Overall Experience in the Middle East at the 2018 APEX Passenger Choice Awards ceremony held during APEX Asia in Shanghai, China. In July 2017, Emirates and flydubai announced an extensive partnership; with the two Dubai-based airlines joining forces by leveraging on each other’s network to offer customers unmatched travel options. For flydubai customers, they will have seamless connectivity to Emirates’ worldwide destinations spanning six continents, while for Emirates’ customers it opens up flydubai’s robust regional network. With initial codeshare flights to 29 cities, this has now expanded to 89 destinations across four continents including Europe. Additionally, Emirates offers the flexibility for customers to book flights to one city and return from another city through its open jaw booking option. Emirates currently operates 18 weekly flights from Manila to Dubai, as well as a daily service from Cebu and Clark to Dubai, with a Boeing 777-300ER, connecting passengers to a wide number of destinations in Europe, the Middle East, and the Americas. For more information about Emirates and the promo or to book tickets, please visit the website. Terms and conditions apply.